The last ship has left the Neva, and the troika racers, ice skaters and fishermen have claimed it for their playground and larder until spring’s thaw. Leaving St. Petersburg by sea is impossible. The fifty-thousand non-slave railroad workers have returned to their homes in the western provinces of Smolensk, Vilno and Vitebsk. Mostly Belorussian and Lithuanian serfs, they are the American equivalent to the Irish, society’s lowest class. Hundreds of Izvozchiki or cabmen—notorious for getting lost—have arrived in the city for the winter with their sleigh taxis. Heavy snows are unusual here, but since warm melts never occur, the constant light dustings produce depths that quickly render wheeled vehicles useless. The cold is killing. In February 1844, thirty people were found frozen to death in Whistler’s neighborhood during a week of temperatures averaging thirty degrees below zero. The quiet is surreal. Tom has never liked this city. St. Petersburg is the new northern, Russian capital of 500,000, built improbably on forty-two islands in the vast, marshy Neva delta. “Venice of the north” to some, “city built on bones” to others. Thirty-thousand forced laborers died during the first few years of construction. It was Peter the Great’s attempt to re-orient Russia from East to West and match the grandeur of Europe’s glamour capitals, especially Amsterdam, with its bridges and canals. The dreary weather, large population of bureaucrats, and straight boulevards contrast starkly with the warmer people and winding lanes of Moscow. Moscow’s tapestry of burnished blue and gold cupolas evokes Asia rather than St. Petersburg, where every structure’s plans must be personally examined by Czar Nicholas. Welcome and cozy are words that infiltrate conversations about Moscow; never those about the Czar’s Capital. Tom calls St. Petersburg the brain and Moscow the heart of Russia. Tonight, he is in his coupe traveling to visit the Whistlers in the English Quay. For much of the morning, daydreams about the future preoccupied him. His twenty-fifth birthday looms on December 9. With wealth, good health, and a home being built in America, the instincts to find a wife during this last year abroad are wielding an insistence that’s annoyingly intrusive to his daily routines. Haunting him is Whistler’s counsel that his father Ross will never approve of a Russian bride. He must soon craft a letter explaining his feelings and seeking his father’s approval, but the reasoning skills of Socrates will be needed because Ross Winans legitimizes the legendary reputation of the Dutch for stubbornness and ingrained opinions on everything. The life of his mother, though he loves her dearly, is not what he wants for his bride. Tom believes his mother Julia has stoically endured a life of abject servitude, sharing very little intimate time with his work-driven father. Tender moments have been few, and now infirmities assault her as though a single beast with many tentacles. A scion of the proud De Kay family, which once owned most of the northern end of Manhattan, she’s reduced to days of moaning and clamoring for the return of her eldest sons. Doctors give Ross a “change of life” diagnosis and opine that her problems will pass, which increases his avoidance of her and exacerbates her loneliness. Tom wants a bride who’s more than child-bearing chattel. St. Petersburg women impress him as educated, opinionated, and curious about the world beyond their immediate households. To compensate for his lack of formal schooling, he craves a wife who can deepen by example his appreciation for history and the arts, especially music, and be a companion for him as well as a mother for his children. Ross Winans would sooner sever his right hand than equivocate over expectations that his first-born focus on family enterprises, match his own work-ethic, and find a spouse who can bear children, raise them properly, and manage the household seamlessly. Tom shudders at the probable repercussions of the letter he must write but takes comfort that when his father receives it, an ocean will separate them. Internally, he rails at the unfairness of a society which prescribes the actions of men almost as rigidly as it does women. Is he selfish to crave the freedom to design a life which emerges from the gigantic shadow of Ross Winans? Is he guilty of disappointing his family and deserving of society’s scorn if he allows wealth to fashion a family paradigm in which work plays a lesser role than it has for his ancestors? Is he an ingrate for accepting the perquisites of being an eldest son while hoping to jettison some of the tethers? “Privileged ne’er-do-well” is not a legacy with appeal. As though answering his musings, the coupe bounces roughly through a rut, jarring Tom as a parent might shake a disrespectful child. Do dreams of a comfortable life make him an unworthy descendant of Jan Wynants, who emigrated from Holland and settled in New Amsterdam in 1664, the year the British acquired the colony and renamed it New York? Jan quickly re-spelled the family name Winans to facilitate trade with his English neighbors. Later, Tom’s grandfather, great grandfather, and great-great grandfather fought side-by-side under George Washington during the American Revolution. His grandfather was only fifteen-years-old when he fought the British, and, before departing for Russia, Tom was given the musket William Winans used in the war. Much of the Winans’ wealth was contributed to that cause. Magnanimously, they bore no ill will when the post-war Congress declined to reimburse them. Tom admires his ancestors’ heroism and generosity, but there are no wars for him to fight or finance. A unique life, not an easier one, is his tantalizing wish. He wonders whether other wealthy sons are as conflicted over life’s milestone decisions. Tom has a simmering, volatile conviction that having the wealth to design one’s own life without the freedom to do so is more stifling than being poor with unfettered initiative. 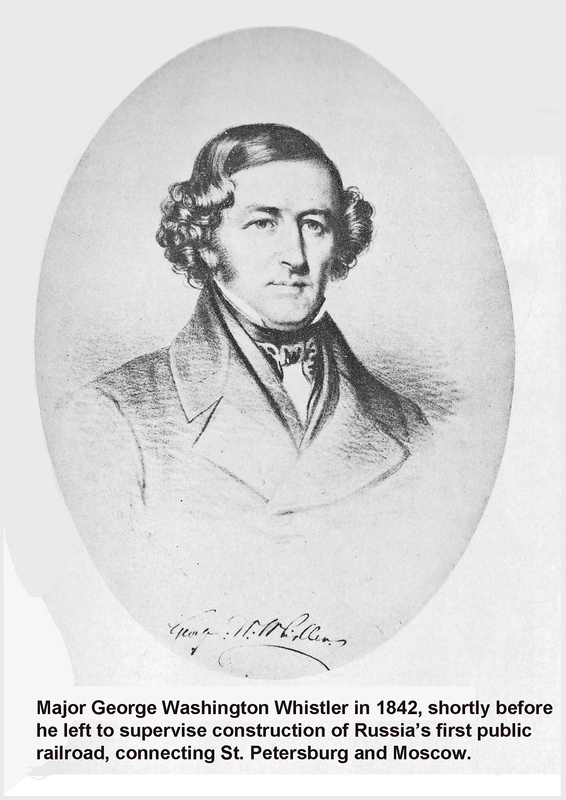 His father did provide an enviable railroad engineering education at the Mount Clare yards along with the Russian opportunity that made him wealthy, but Tom worked extremely hard, earning the admiration of the Czar, Count Kleinmichel, and Major Whistler, along with the respect of the workers he trained and led. The vexing rub is that he will never know if he could have become rich on his own. Beyond his mother’s plight, Tom thinks of his military hero Napoleon’s tempestuous relationship with Josephine, of the brute Kleinmichel’s hapless wife, of the Czar and his fecund mistress, and, more ominously, of Whistler’s overbearing second wife Anna. All powerful men; all unhappy men. When Whistler’s beloved first wife Mary died, he was left with two children, George and Deborah (Debo). Their lives became gypsy-like because the Major was assigned to survey work along the U. S.-Canadian border. Anna’s brother, Captain William G. McNeill, was an 1817 West Point graduate who became friends with the younger Whistler at the Academy. McNeill headed one of the original three B&O Railroad survey teams in 1827. With no wars to fight, the army allowed its engineers to work on road-building and railroad projects because West Point was the nation’s only engineering school and it was in the national interest to build transportation infrastructure. In 1828, he became part of the B&O’s original senior management team—along with Lt. Col. Stephen H. Long and Jonathan Knight—and encouraged then Lieutenant Whistler to apply for a railroad assignment in order to provide a more stable life and a better education for his children. Whistler took that advice and soon became reacquainted with McNeill’s sister Anna, who had loved him during the West Point years and in her words, “set my cap for the man I loved at first sight.” They married in 1831. McNeill’s career subsequently deteriorated and he descended into alcoholism. Antithetically, the Russians were dazzled by the Major’s combined management and engineering skills, which culminated in the seven magnificent arched, stone bridges through the Berkshire Mountains, making rail passage possible between Boston and Albany. The Czar had fired French and English engineers because they wanted to detour around obstacles such as the marshes of Novgorod, the hills of Valdai, and areas subject to river floods. Nicholas wanted his railroad built in a straight line, and Whistler was clearly someone who could conquer obstacles. As Whistler’s renown spread, he felt conflicted about his old friend McNeill’s plight. Last year, although McNeill campaigned for James Polk in his successful bid for the presidency, political opponents got him fired from his job as engineer of the Brooklyn Navy Yard. Though indebted to his brother-in-law, Whistler could find no role in Russia for the alcoholic McNeill, who castigates the Major as ungrateful to anyone who will listen. To pacify Anna, Whistler regularly but fruitlessly sends McNeill money to mollify him. Ironically, those payments are arranged by Captain William H. Swift, who is the American adviser to Baring Brothers Bank, the Major’s best friend and trusted adviser, the eldest sibling of his first wife Mary, and a man who despises both Anna and Bill McNeill. Tom perceives Anna as a woman given excessive freedom by her husband. She is a religious zealot, an Anglican who foists her views on whomever is at hand. She self-righteously nags the Major and his daughter Debo to play only liturgical music rather than the corrupting new waltzes they love, and she has jeopardized the Russian project by secretly distributing pamphlets to the peasants in an attempt to convert them. Anna believes her mission in Russia dwarfs the railroad’s in significance, and she conscripts her two surviving young sons Willie and Jimmie to help distribute those pamphlets. Whistler fears they will all be expelled if the Czar discovers this proselytizing. While Anna is encouraged that many peasants seem eager for the pamphlets, the Major hasn’t enlightened her to the fortunate reality that the predominately illiterate peasants are eager only for the paper, in which they roll their tobacco. The apple of Whistler’s eye is his nineteen-year-old daughter Debo, who despises her stepmother Anna. To pacify Debo, the Major goes to great expense to support her in England during the summer months. Ostensibly, it’s to protect her from the rampaging summer diseases, but, in reality, it’s to preserve his daughter’s happiness. Tom also knows that Anna squanders money on gifts and charity to the extent that the Major may go home from Russia no wealthier than when he arrived. Whistler has confided that at their current spending rate, he will be fortunate if the little he saves and invests earns him $1,000 a year after completing the railroad. Tom thinks back to his September ride along the chausseé with the Major and Count Kleinmichel. The two are depressing contrasts in familial failure. Neither Whistler’s lack of control over the religiously officious Anna nor Kleinmichel’s tyrannical dominance of his wife makes an appealing role model. They add to a growing preponderance of scenarios in Tom’s life which nibble insidiously at his conviction that a life with power and joy in equilibrium is possible. His penultimate nightmare is an attractive, confident woman metamorphosing into an Anna-like wife, a fear eclipsed only by the specter of premature death in childbirth for his as yet undiscovered beloved. The Whistlers have made it a point to have lots of company in their home since the October 14 death from dysentery of their one-year-old son John Bouttatz Whistler. They named him for Major Ivan Bouttatz, who was assigned by the Russian army to accompany the Major on his trip to Russia in 1842—before Whistler sent for his family—and became a good friend. Whistler knew no one in Russia when he embarked on this adventure and spoke neither the French of socialites nor the Russian of commoners. Bouttatz’s companionship kept him from quitting in despair. Little Johnny’s body was sent back to Stonington, Connecticut, where the Major had built a railroad connecting Providence, Rhode Island, and where the family burial plot perches on a high bluff overlooking the sea. Tom finds it ironic that he, who has nothing to be sad about, is always cheered by visits to the Whistlers, even in their grief. They’ve now lost three sons to disease since the Major’s departure from America. Tom’s life seems buoyed whenever it’s immersed in family dynamics, however flawed. At the Ritter Dom, there’s a festive atmosphere in the home. Debo and family friend Ellen Ropes are playing waltzes on the piano. Dancing alternately with twelve-year-old Jimmie and younger brother Willie is a friend of the Ropes, a twenty-three-year-old raven-haired beauty named Celeste Revillon. They’re dancing to a favorite of Debo’s, Johann Strauss’s Echoes of the Rhine Loreley. An international flavor enlivens the apartment with the Ropes’ French-born friend Celeste, Mary the Irish nurse, Johann the German footman, and Maria the Finnish cook all mingling with American, Russian, and English guests. Christina the laundress, Dunia the housemaid, and Monsieur Biber the tutor round out a very expensive staff which frees time for Anna to visit the sick and convert the peasants. Equating merriment with sin, Anna fades into the background tonight, wounded but silent. She has learned that tantrums and manipulation are futile with the Major and Debo, who chart their own courses, oblivious of protestations about her gloomy God’s disappointment in them. After introductions, Tom settles in with Whistler—each lighting a German cigar—and inquires about the origins of his deep friendship with the Ropes. A quick pulse of incredulity, then insight, distracts Tom; that it has taken four years to ask this question is evidence that his work meets his father’s standard for intensity. Prior conversations with Whistler have focused on business. Dancing is a Russian passion and the signature of a cultured person to Tom. It’s a skill he’s never acquired. Tom confides to the Major that he will have an outing and a long chat in the near future with his brother Bill on how to craft the letter that will broach his marriage plans to their father. Before Whistler can respond, Debo grabs her father’s arm, yanking him to his feet. As Ellen begins another waltz on the piano, Debo snatches Tom for her dance partner. “Your Mr. Haden will be angry with me and you imperil your feet,” says Tom, as they awkwardly gain sync with the music. As the Major returns to the room with his flute, he sees Celeste, now dancing playfully with one of the Ropes’ daughters, steal a quick glance at Debo and Tom.